Born in Spain in 1852, architect Antoni Gaudí became famous for working at the forefront of Catalan Modernism, an artistic and literary movement that sought to establish Catalonia as distinctly modern and urban. Throughout his career, his bright, audacious designs stood out from the long-standard building practices. For Barcelona’s Park Güell, he used natural, organic shapes paired with colorful mosaic tiles. The family homes he designed, such as the Casa Calvet and Casa Milà, were just as bold. His Casa Batlló, for example, features elongated windows, a scale-like roof, curved entryways, and undulating ceilings, giving the home a surreal, psychedelic effect. Gaudí was well-known and respected, and he made good money designing homes and public spaces. In 1883, Gaudí began designing Sagrada Família, the enormous Roman Catholic basilica in Barcelona most associated with his name. Nicknamed “God’s architect,” Gaudí stated that he designed and built all his work for the glory of God. He didn’t marry or have children, instead focusing steadfastly on his work and his Catholicism. As he got older, Gaudí became more religious, attending Mass and praying each day. He engaged in extreme fasting, shunned meat and alcohol, and reportedly ate only lettuce dipped in milk for a typical lunch. After several of his close friends, relatives, collaborators, and patrons died in the early 1910s, he threw himself further into his work. He moved into his workshop inside the Sagrada Família, gave up all other work in 1914, and turned down interviews. His hygiene habits also went sharply downhill; he wore shabby, ragged clothing, and stopped shaving. On June 7, 1926, during his daily walk to confession, Gaudí was hit by a tram along the Gran Via de les Corts Catalanes. Because of the 73-year-old's unkempt appearance (and the fact that he didn’t have identification in his pocket), people who witnessed the accident thought he was a beggar. Gaudí lost consciousness, but taxi drivers wouldn’t bother taking a beggar to the hospital. A doctor who lived along the Gran Via, Dr. Ferrer Solervicens, was alerted to the accident and went to examine the old man, but he concluded that nothing could be done. A police officer eventually took the gaunt, injured Gaudí to the Hospital de la Santa Creu, where he got only the rudimentary care that a pauper would receive. 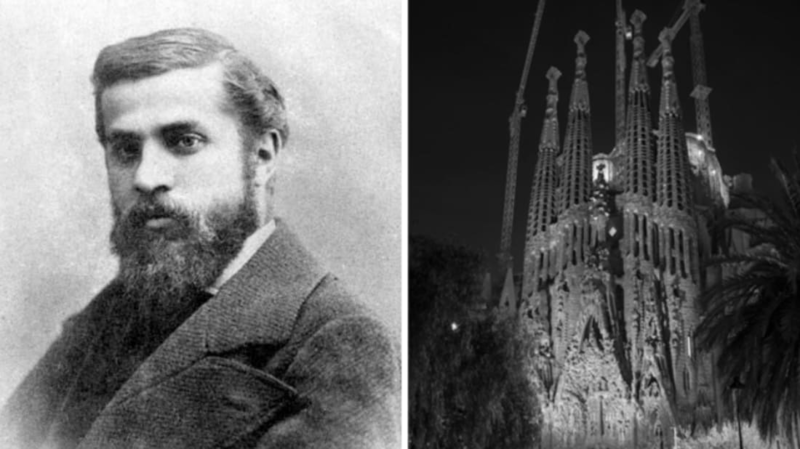 It wasn't until the next day that the chaplain at the Sagrada Família recognized the beggar as the famed architect, but it was too late—Gaudí died two days later, on June 10, 1926. The residents of Barcelona mourned Gaudí’s death, lauding his divinely inspired work; his funeral procession snaked through the city, ending at his immense, unfinished church. He was laid to rest in the crypt of the Sagrada Família, underneath the continued efforts to finish his elaborate, colossal sanctuary. That work is still underway, 90 years later. Current projections expect the Sagrada Família to be finished in 2026, in time for the 100th anniversary of the great architect's death.